As far as anatomy is concerned, snowy grouper are very similar in shape and size as other grouper. Their spots give them their name and set them apart from the other species. Snowy grouper are a deep drop species that inhabit much deeper areas than their other grouper relatives. I've caught snowy grouper as shallow as 250 feet but most of my good spots are 350-650 feet. As far as structure is concerned, snowy's like rocky bottom. Most of the water in 350-650 feet off Miami is mud so it definitely takes some looking around to find the right spots. If you do however, they can be pretty reliable as long as you don't try to catch too many. Like most deep drop fish and benthic species, these fish are slow to grow and reproduce. "Deep dropping" with chicken rigs is the primary technique for getting down to snowy grouper. Because of the depth, electric reels are standard for targeting snowy's though we have caught them manually. 5 pounds of lead is usually the way to go. For chicken rigs we like to use 130lb pound test with 3-5 hooks and a light. Whoel squid and bonito strips seem to work really well for producing bites. 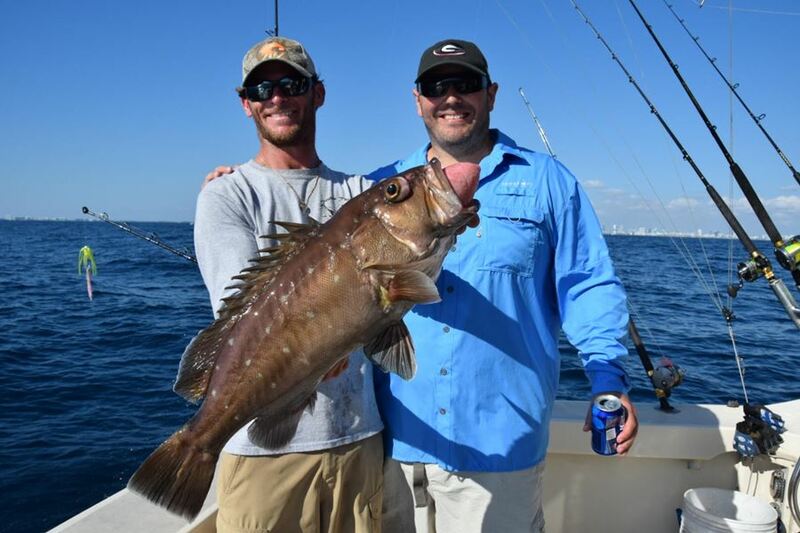 Snowy grouper are seasonal and have a poor survival rate when released due to air bladder inflation and the extreme depth. With this being said, it is best to only target them during the season and plan to keep them. They are absolutely delicious.